It’s peculiar thing to be the mother of a twelve year old girl. I don’t know that it would be strange for everyone, but to me, it is. Maybe it’s because my 12th year is incredibly vivid to me. It was the year that my parents plucked me from the public school and turned me over to the Sisters of the Sacred Heart, so the nuns could teach me how to wear a skirt and fill in the spiritual holes my parents feared they might be leaving behind due to our busy lives. And yes, there was the education too. But I’ve been told that the uniform was the biggest draw – a surefire way to soften my tomboy ways and teach me to sit like a lady. Query whether any of it worked at all. So I have this very vivid memory of this very vivid year in my life. A year filled with angst, emotion, new girls, all girls, intense schoolwork and shrill, obnoxious laughter. And what I remember of this coming of age, is not quite jiving with the kid in my house. Supergirl also switched schools this year. And yet, she is so much more self-possessed than I ever was. I can’t get in her brain, I can’t truly know what she’s thinking or feeling, but man, from the outside she’s as centered, happy and easy as they come. Will this be the year she remembers as the year her mind kind of woke up? I wonder. She seems like she’s been awake for a long time. It’s funny to me that my parents thought they might be able to effect some change on me, my ways, my persona. When it comes to Supergirl, I can’t shake the feeling that she landed on this earth holding within her all the tools and talents she would need to become who she is. I’ve said it before, but I can take very little credit for her. This is not a kid who has needed much in the way of molding. Dash and I pretty much sit back and watch as she makes her way through, vicariously enjoying the ride and watching her grow up in a world where (to her) every one is a potential friend, or at least someone worth having a conversation with. 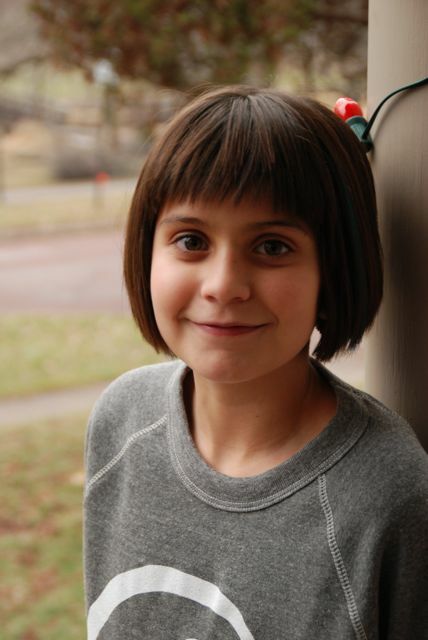 As my girl embarks on her 12th year, I feel as grateful as ever – I am lucky to call this little chick my friend. As of now, she’s game to pal around while I do errands, keeping me entertained with a seemingly endless stream of amusing stories and quirky observations. What I notice with her and my friends’ girls around this age is that they really are like little ladies. They look like kids, but all of a sudden they have this capacity to communicate and understand that makes them really fun to be around. But I’m also excited. She’s the kind of person with slightly off-center curiosities and she finds a way to go deeper. I’ve always admired that in other people. This past year I’ve watched her explore the worlds of jazz, yarn bombing, succulents and cacti, cartooning and entrepreneurship based on human connection – the latter a pretty successful sidewalk “free advice” stand that yielded copious tips and some new found friends and fans. She was like Lucy, but nice. She also became kind of Jewish for a while, joining a group of kids for snacks at Lady Tabouli’s before Hebrew school on Wednesdays. I can’t wait to see what else she decides to explore and try her hand at. I can’t wait to meet the people she connects with. I can’t wait to see what comes next for my Supergirl. Happy birthday, to my dear sweet girl. This entry was posted on Thursday, December 25th, 2014 at 9:28 amand is filed under Girl, Mental, My Monkeys. You can follow any responses to this entry through the RSS 2.0 feed. You can leave a response, or trackback from your own site. Peevish is back!!! At least for a spell and I couldn’t be happier! Aaand this amazing chica of yours is a treasure.